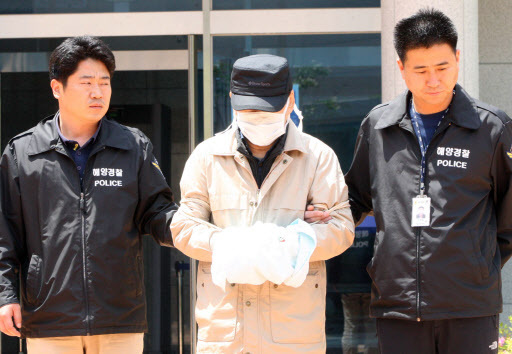 Kim Han-shik, CEO of the sunken Sewol’s operator Chonghaejin Marine Co., was arrested Friday on a string of charges including manslaughter. The joint police-prosecution investigation team suspects that Kim was directly involved in overloading the Sewol, and in developments that led to the ship having structural irregularities. Along with the investigation into the sinking, that into Yoo Byung-eon, the Sewol’s de facto owner, continued to develop rapidly with Incheon prosecutors raiding more locations linked to him Friday, as they sought to uncover wrongdoings committed by him and his family. The growing list of allegations against the Yoos includes tax evasion, illegal real estate transactions and violating foreign exchange laws when transferring large sums out of the country. In addition, the investigators are said to be planning to charge Yoo with manslaughter, after finding evidence that he was directly involved in running the Sewol’s operator, Chonghaejin Marine Co. Locations raided on Friday include Moreal Design, an interior design firm, and a consulting firm owned by the Yoos. Moreal Design, headed by Yoo’s daughter Yoo Sum-na, is suspected to have been involved in forming the family’s slush fund. The Yoos are believed to have siphoned off billions of won, mainly through actions disguised as purchases of Yoo’s photographs. As with Yoo’s second son Yoo Hyeok-gi, Sum-na has so far ignored the prosecution’s summons. The authorities are considering measures including revoking her passport and cooperating with foreign governments to secure her person. Since the ferry sank off the country’s southwestern coast on April 16, Yoo, a former chairman of the defunct Semo Group, has been found to have control over a network of businesses. Most of the businesses, operated by Yoo’s closest associates and his children, are thought to be involved in criminal activities allegedly carried out by the Yoos. While the Yoos elude the authorities, actress Jeon Yang-ja was to be questioned Friday over her role as the chief of a Yoo-owned company. Jeon is a member of the loosely Christian cult founded by members of the Yoo family. As the authorities continued their investigation, bereaved relatives of Sewol’s casualties marched on the presidential office, demanding to meet with President Park Geun-hye. In her stead, senior presidential secretaries Park Joon-woo and Lee Jung-hyun met the families to hear their demands. However, the families held their position, saying they would not leave without meeting the president. In addition, Kim Si-gon, chief of the news division for state-run broadcaster KBS, resigned over his controversial comments about the Sewol incident. On Sunday Kim made remarks that appeared to downplay the scale of the Sewol incident, inciting widespread public anger. As for the search operation, divers were deployed to recover those who remain missing 23 days after the accident. As of 6 p.m., 31 of the 476 people aboard the ship remained missing. The death toll stands at 273. The search team has also expanded the search for bodies to an 80 kilometer radius of the wreck in the hopes of finding those that may have been carried away by the current.